The BRAC Certified Sites initiative was established to identify new development-ready sites in the Capital Region and increase the number of certified sites available to economic development prospects. BRAC’s program represents partnership among the organization, the local economic development organization or parish, and the land owners. 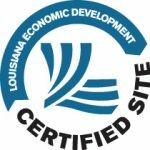 Louisiana Economic Development (LED) Certified Sites are development ready industrial, manufacturing or office sites that have undergone a rigorous review of site characteristics. Specific site details, such as zoning, restrictions, title work, traffic count studies, environmental studies, soil analysis and surveys, are assessed for compliance and authenticity. In addition to the traditional certified sites program, BRAC participates in the Certified Business Sites program, specifically for sites between 10 and 25 acres. To learn more about the Certified Business Sites program, visit the Louisiana Economic Development website. For more information regarding property or custom site selection services for your project, contact our Business Development team. Baton Rouge has experienced major redevelopment in commercial office and industrial space. Currently Baton Rouge enjoys approximately two million square feet of available office space of all classes and sizes, while progressive builders in the area are pushing forward with new projects which include live/work/play environments that support collaborative business interactions. Redevelopment and new development can be found all over the Baton Rouge region, which enables companies to find best-fit options for price range, workforce availability and amenities. In the city, major new projects can be found along Nicholson Drive, Downtown, Bluebonnet Drive, Sherwood Forest and Siegen Lane which cater to financial, medical and back-office operations.